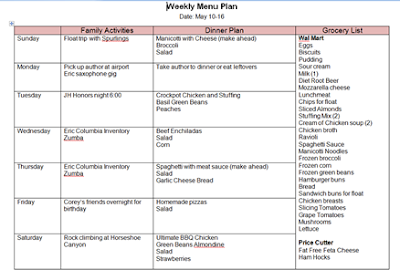 Thanks for sharing your menu plan templates. They look very useful. Mmmmm...manicotti! I haven't had it in a long while. Thanks for sharing your planner sheet, I'm always looking for new ways to organise. Super neat meal planning chart!! Love the menu... I am always looking for new recipes. I came through Org Junkie's Menu Plan Monday Linky. I can't wait to see what next week brings. My husband wants to see that movie. I hope that you start feeling much better soon. Stop by BerryMorins Bits & Tips, leave a comment for a chance to win a $25 from vinylvineyard at Etsy.com!